Toxodon, lines for name and address at right, Smilodon at lower left. Lines for sender's name and address on flap, proboscideans on reverse. Diprotodon skeleton, shell, clock, medal, and Aboriginal painting at left. Lines for sender's name and address on flap. 120-th anniversary of the Natural History Museum. Amethyst crystal on the stamp, lines for address, boxes for the post code. At left (here shown at right) a.o. Deinotherium skeleton. 'POSTAGE PAID / PORT PAYÉ' and lines for name and address at right, 'ROYAL ONTARIO MUSEUM / MUSÉE DE L'ONTARIO / 1914-2014' at bottom right. On the stamp and on the reverse museum items, including fossil Parasaurolophus. Peking man (Homo erectus) on the stamp. Boxes for post code of sender and recipient at top left and bottom right. Peking man family scene at left. Boxes for post code at top left, explanatory text in Chinese on reverse. This cover exists with a number of different images, mostly buildings, at left, I have over thirty in my collection. These were printed for companies and institutions, apparently by the Chinese mail. 'GEOPARK', logo, and four landscapes at bottom left. China Dinosaurland theme park at Changzhou, five different. On the stamp: Pteranodon, Brachiosaurus, Triceratops, and Tyrannosaurus. Four cards with attractions in the park on the reverse, each including (parts of) the J. Sibbick painting of Ceratosaurus and Brachiosaurus, one smaller card with a blank reverse. Note: These cards are/were only available at the Dinosaurland park, and are therefore only semi-official. Large cover, 16 by 23 cms. Stamp image: theropod statues on a lawn in front of a modern building. Image repeated at lower left. China Dinosaurland theme park at Changzhou. 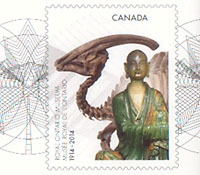 Sinosauropteryx fossil and pagoda on stamp. Exists with (at least) six different images on the left, a.o. reconstructions of Sinosauropteryx and Confuciusornis, a gate, a building, and archaeological finds. Explanatory text in Chinese on the back. Ammonite Parapuzosia, lines for name and address at lower right, barcode at lower left. Old illustration of museum interior on reverse. on reverse, in light gray, a.o. brachiopod, trilobite (Calymene), and Euomphalus fossil. Room for address, five boxes for post code. Centenary of the discovery of the Niaux cave and cave paintings. Set of five, each with a different image at left. On the reverse cave paintings (Bison). 'Postkarte' and dotted lines for name and address at right. 'Prähistorische Tierwelt in Deutschland' and prehistoric fishes at bottom left. dotted lines for sender's name and address at top left, at bottom left '20 Gewinner / Dino-MalWettBewerb', children's drawings of dinosaurs. On the stamp: Brachiosaurus skeleton, recent animals, '200 Jahre Museum für Naturkunde Berlin'. Lines for address, at top left lines for sender's name and address, at bottom left a tortoise and a snake, 'JUGEND REPTILIEN / TAGE' and 'Internationale Briefmarken-Börse / Sindelfingen 29 bis 31. Oktober 2010'. White cover with blue and red margin. and Korean text in box at bottom left. Comptonia naumannii plant leaf fossil. Edaphosaurus reconstruction by Z. Burian at bottom right, fossil lower jaw at bottom left. Orthoceratid nautiloids on the cover, brachiopod fossils at bottom left, trilobite Tsinania at bottom right. and Korean text in box at top left. Neuropteridium fossil, at lower left another fern fossil and a short text in Korean. Yoldia shell fossil, white rectangle for address, Clinocardium asagaiense shell fossil at bottom right, recent fish in the background. 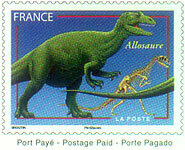 Lozenge-shaped stamp with Tyrannosaurus misidentified as Allosaurus. Drawing of Allosaurus at bottom left. Megalosaurus stamp with printed perforations. 'Dinosaurs' at bottom left. Reverse: Pteranodon, two sauropods (Apatosaurus? ), Chasmosaurus. 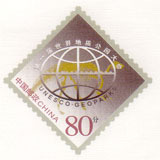 Chasmosaurus stamp with printed perforation. 'AEROGRAMME / VIA AIR MAIL' at top left. Drawing of a theropod (Tyrannosaurus?) at bottom left. 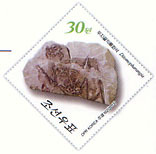 Ditomopharangia fossil on stamp with printed perforation. Four korean characters at top, vertical centre line. Fossil crab on the reverse. 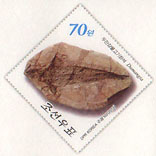 Dumangia fossil on stamp with printed perforation. Fossil brachiopod at lower left, otherwise blank. Hormotomaria fossil on stamp with printed perforation. 'AEROGRAMME / VIA AIR MAIL' at top left. Fossil bivalve shells at lower right. Rectangle with one line of Korean text for address. 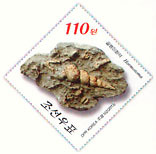 Description: Mene fossil on the stamp. Lines for name and address at right, vertical line of Arabic text at center, blank at left. Stamp image repeated on reverse. Set of two, the other card shows Stegosaurus. Long narrow cover, blank except for stamp. The ammonite is probably Acanthoceras. Description: Ammonite Perisphinctes on the stamp. Lines for name and address at right. 'Instytut geologiczny 1919-1970' in red at top. 'WARSZAWA' and building exterior at left, 'kartka pocztowa' at bottom left. three lines and five rectangles for address and post code, mountain landscape and bird of prey on a rock. Lines for name, adress, etc, at right. Animal and name at left. Lines for sender's name, address, etc, on flap. Set of four: on the stamps: Iguanodon, Pterodactylus, Deinonychus, and Pteranodon. 'Carte postala', 'Destinatar', and dotted lines for name, adress, etc, at right. Australopithecus olteniensis family scene and text at left, dotted lines for sender's name and address. Reverse blank. Portrait of biospeleologist E. Racovita on the stamp, skeleton and reconstruction of Ursus spelaeus (cave bear) at left. Four lines for name and address; boxes for post code and town. From a set of four. Instructions for filling in post code on flap. Pictorial elements of the stamp arranged in a circle with Livistonia at right, surrounded by text. Boxes for post code at lower left. Reverse blank. Pictorial elements of the stamp with text, arranged in flower shape at left. Livistonia at left. Boxes for post code at lower left. 'Destinatorio', 5 lines for address and number at right. At bottom left '80 - 15 DINOSAURIOS. Tiranosaurio'. 3-D stamp with printed perforation. On the reverse a 3-D image of a Tyrannosaurus in horrible colours. Biographical data of V.T. Hamlin at top left. Part of a set, cartoons.